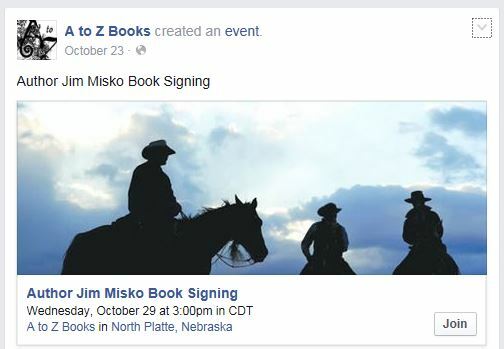 In this article my friend Jim Misko describes how he organized and carried out a statewide book tour for his new novel. 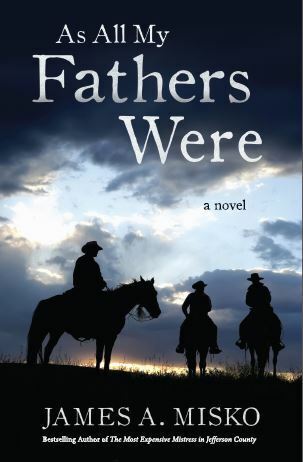 Here’s how he titled this article: From Omaha to Ogallala: The Nebraska book tour of James A. Misko for his new novel As All My Fathers Were. Note: Jim sold 720 copies of his new novel in just 11 days of touring. Most copies were sold at full price: $19.95. But Jim had to share the net with the bookstore and his distributor as described in the article below. So, let’s say he netted $10 per copy sold. That pays him $7,200 for 11 days work (less expenses). Not bad for a relatively unknown novelist. After reading Howard Frank Mosher’s memoir The Great Northern Express and Pamela Hutchins 60 B&N’s in 61 days, I decided to do a much shorter tour of Nebraska following the Platte River from its mouth to where the North and South Platte meet which is the site of my latest novel, As All My Fathers Were. Howard went 20,000 miles over six months and lived on $100 a day, which often took him to a motel in a disreputable part of town. Pamela went 17,000 miles all across the south and east United States in 61 days and kept an admirable record of all expenses as well as the items that broke down on her motorhome. I planned eleven days, twelve cities, and fifteen book signings. I didn’t count the mileage, had no breakdowns, and squandered much of our earnings on good motels, good meals, and gasoline for the GMC Yukon that hauled twenty-six cases (416 books). While my distributor had mailed many cases to my hosts, some of the libraries and bookstores where we held the signings asked me to bring books instead of ordering them. Plus I had gift books for libraries, book store hosts, and managers of businesses along the way. For entrance into several state institutions, I had the backing of the ex-Secretary of State for Nebraska, Allen Beerman, and my PR person, Nichole Hutchins of Skipjack Publishing. Allen got acceptance of my books in many state venues such as Kearney Archway, Mahoney State Park, Stuhrs Museum, and twelve of the Sapp Brothers Family Travel Centers on Interstate 80. With those boosts I started the process of calling and convincing. The demise of independent bookstores shortened the list but every town had a library. Some weren’t open at times I was available. That is one drawback to a book tour. You may not be in the right place at the right time to interact with their customers or patrons. Some of the times I was available to sign at a library were not good times to catch library patrons eager to spend $20 for a new book. Another hindrance to touring is that some bookstores just didn’t get the books they planned on getting: Author to the rescue with four hundred books in the truck. All but three of the places I called could accommodate an author’s book signing. Two libraries would not be open at the times I came through their town and one B&N did not have room to accommodate a signing. Wherever there was a town newspaper, I sent a free prepublication copy of my novel, along with a press release, a tour poster, a copy of blurbs, and a synopsis. Interesting, there were two errors on the poster but nobody brought them to my attention until the tour was over. Two readers spotted the misspelling of McMurtry’s name and I caught the other. New posters were crafted for upcoming book signings. Some libraries that couldn’t accommodate my signing on the date I was coming through bought books. And one bookstore that was in the process of moving took books on consignment. I split proceeds from the book sales 40% to bookstore, 60% to my distributor who takes his share and gives me the rest. Most libraries let me take 100%. Originally I planned on doing two to three signings a day. That quickly dwindled to one or two. They stretched from two to four hours each. It was too demanding to do more. It settled out to fifteen signings in ten days—we took a day off in the middle—in twelve towns, or 1.5 signings per day. A book launch at Barnes & Noble in Anchorage netted 100 sales the day before we flew to Nebraska. The 15 book signings in Nebraska chewed up another 720 books. My book launch was capped by a signing at our winter home in California at the Barnes & Noble in Palm Desert, where at the end of the day I sold 60 books. The Nebraska tour started in Lincoln at Barnes & Noble and ended in Ogallala at the library. They were all eager to host a Nebraska born and bred author and expressed a willingness to work with other authors of the Nebraska Writers Guild, should one be coming through the territory. Ranchers Richard and Seth Barrett are devoted to running the family ranch on Nebraska’s Platte River. It is their intent to keep doing so the rest of their lives; however, the terms of their mother’s will requires them to travel up and down the Platte River by horse and canoe, to understand why their maternal grandfather homesteaded the ranch three generations earlier. If they don’t complete it within 61 days, they don’t inherit the ranch. From the grave, she commands them to observe industrial farming’s harm to the land, air, and water. A 90-old bachelor farmer, with a game plan of his own, butts in threatening to disrupt and delay the will’s mandatory expedition. Using a gullible hometown sheriff and a corrupt local politician, a conniving, wealthy neighbor seeks to seize the property and thwart their struggle to keep the ranch and meet the terms of the will.